Davos from the Jakobshornbahn. The Parsennbahn funicular railway can be seen in the top right of the picture. Getting to a resort quickly and efficiently is something that any skier or snowboarder would applaud, and we were clapping our hands as Swiss Railways got us closer to the mountains. Our flight from London City to Zürich was straightforward. The train from Zürich airport into the city was on time, our train from Zürich centre to Landquart, erm, on time (even permitting a quick on-board lunch of risotto, stew or pasta, table-served of course – eat your heart out South West Trains!) and once boarded, our train to Klosters departed as the second hand passed 12! Arrival: two hours and 12 minutes after leaving Zurich Airport, as our itinerary, and just under five hours from take off in London. Moments later we were checked into our hotel, marvellous. We even had time to try curling at the ice arena before the sun set. Klosters and its bigger brother Davos (www.davos.ch) lie in the Swiss canton of Graubünden, which borders Italy, Austria and Lichtenstein in the south east of the country. Whilst Davos is a full-blown town, Klosters fits the Alpine image to a tee, with its low rise and often chalet style buildings. Both resorts have central railway stations close to the gondola stations. You can probably be on the lift within a minute of getting off the train. Klosters has some local skiing, nursery slopes and the runs at Madrisa, but our first full day’s target was the extensive Parsenn area that lies in the mountains between Klosters and Davos. The two-stage Gotschnabahn rises from beside the railway station over pine-clad slopes up to the imposing Gotschnagrat peak. The morning saw clear blue skies, but it was -16C, so sun cream and woollies were the order of the day. As we drifted down toward the heart of this area, around the Parsennhütte, six or seven options back up came into view: the area is well appointed for lifts, albeit a couple are T-bars. And there were plenty of wide, open slopes too. Above the treeline and open to the elements this could be a sparse environment but, in this sunny circumstance, one thing that wasn’t thin on the ground was snow. The pistes were in glorious condition and despite a lack of recent snow, there were still some fresh tracks to be found too. Atop Weissfluhgipfel (2845m) snow-capped peaks could be glimpsed through distant clouds and beneath us there was just a wide open blanket of white. The gloriously long black then red run down towards Schifer from here proved the most enjoyable run of the day. After lunch at Weissfluhjoch, we cruised down alongside the tracks of the shiny new funicular Parsennbahn into Davos. Aside from a couple of steep, narrow pitches at the end of the black run that forms the lower part of the route, it is the only route back into the town so it can get a little busy. The long red down from Gotschnagrat completed our day. A couple more sunny days gave us time to explore Davos’s mountains, using the regular rail service connecting the two resorts (just 34 minutes from Davos Platz to Klosters) – a relaxing and scenic way for an early start or a late finish. 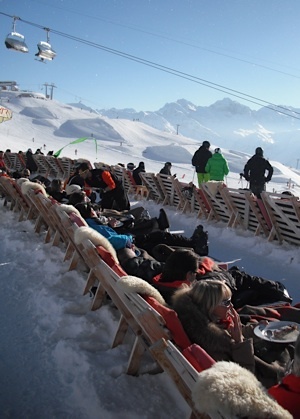 On the Jakobshorn above Davos town champagne and cigars seemed the order of the day at one bar, whilst sun loungers were available for hire at just 25 CHF per day elsewhere; it seems not everyone was intent on skiing every run, not least the well-heeled. In Klosters, the evening norm is delightful dinners followed by a quiet drink. The streets were all but deserted after dark. Aside from one late bar/club, the smoky Casa Antica (www.casaantica-klosters.ch), the nightlife was just about limited to the sound of the piano in the hotel bar. There were plenty of off slope entertainments, however, as well as the Snow Polo event mentioned elsewhere. The rustic Alpenrösli restaurant and guesthouse offered the diversion of an ominous toboggan run back to town after a hearty meal (www.alpenroesli-klosters.ch) – a taxi both ways was the preferred option – and the Alp Garfiun restaurant (www.garfiun.ch) was reached by an hour long horse-drawn carriage ride with a taxi on the way back. As quickly as we had arrived, it became time to leave. Our train was scheduled to leave at 08.32hrs promptly; at 08.31hrs members of our group were rushing onto the platform. Whilst Swiss transportation is renowned for its efficiency, I think we probably still had some way to go. Dave Ashmore travelled as a guest of the Graubünden Tourist Office (www.graubuenden.com) and stayed in Klosters at the traditional style Hotel Pardenn (www.pardenn.ch) where a double room this March is 315 CHF per night, half-board. The tastefully furnished Hotel Silvretta (www.silvretta.ch) remains open for Easter when a double room with breakfast is 300 CHF per night. Both hotels are 4-star and enjoy pool and sauna facilities.